I’ve been doing business at Casco Bay Frames in Portland for multiple years - long before I was involved with photography at the level I am now. If memory serves, my relationship with this excellent business commenced with a gift certificate for framing that was given to me one Christmas. I don’t recall now if I’d been visiting the facility already & this was known or if someone thought I should be, but I went down to investigate getting some astronomy images mounted. It speaks well of these folks for me to indicate that I’ve been doing business with Casco Bay Frames (CBF) ever since. And you can trust when I indicate there are many frame shops in my area that I’ve frequented – this wasn’t a random selection to inaugurate a relationship. If any of the CBF staff ever read this account, please know that I appreciate the great advice and fine service I’ve received over the years. Now that I’ve provided a bit of history, let’s get more into the present… This account actually begins at the end of 2006 when Tony and I were speaking one day about my photographs. He indicated I had developed plenty of material and he’d like to schedule a show of my work early in 2007. I didn’t think about this much until he contacted me in January and indicated a date to launch the exhibit. February 2nd was selected for the reception with the images remaining as the primary exhibit in the shop throughout February. Holly, the Manager, Tony and I met and discussed plans to implement the exhibit and we went forward from there. This account shall serve to document this exhibit. I consider the opening reception a wonderful success, perhaps more of a sucess than anticipated. It was well attended with over 100 people coming by during the three-hour reception and we had great food and beverages of various types. We went through many bottles of wine, enough that we were surprised by the amount when Tony and I discussed this during the event although there were many people to serve throughout the evening. It was an active period and I wasn’t able to spend as much time as I’d preferred with the many folks that were kind enough to attend. I’d have to confer with Tony & Holly, but I believe this may have been one of the better attended openings sponsored by the shop. There were over two-hundred photographs displayed in the exhibit consisting of astronomy, land/seascapes and many bird images. I’ve been photographing birds since the summer of 2006 as this is a pursuit I enjoy. I’d been in Florida for several weeks before the end of ’06 and had over sixty new mountings of various subjects from this journey that many of my friends had never viewed before the reception. I wanted the content to be new and notable to these folks. Tony decided that Holly and Sal would head up the exhibit preparations leading to the reception. We each had specific tasks to follow up previous to the point of hanging the images. The photographs that follow detail the exhibit up to the time the doors were opened for the reception. One of my comet images is displayed on the mantle behind Sal's shoulder. I had a wonderful resource when it came to food preparation for the event. My ‘secret weapon’ is my friend and co-worker Gerard McMahon. I asked Gerard if he would entertain preparing the spread for the reception and he readily agreed. I knew from experience that once he focused on this everybody at the event was in for a treat. I was proved absolutely right in the end result. Gerard outdid himself in this regard and his preparations were fabulous, elegant and extremely well received. Gerard had been planning since I first notified him and had everything prepped as much as possible. We had visited the shop earlier to see where best to set up before the actual day. He decided to use a trailer so his sister Marsha, her daughter Lily and her friend Alex could all ride up together. They arrived in early afternoon and commenced to setting up the kitchen. Gerard's family crew members helped to make certain everything was ready on time, more dishes were brought out as needed and aided greatly in a professional and elegant display. Chef Gerard’s varied menu consisted of multiple trays with brie, blue cheese and walnut spread, grapes and strawberries, a large assortment of crackers and baguettes, shrimp cocktail, fried oysters with tarter & cocktail sauce, codfish balls, rack of lamb lollypops, crab meat dip, stuffed mushroom caps, vegetable and fruit trays, assorted cookies and coffee & tea. Besides the delicacies mentioned, he also provided the serving dishes, elegant in themselves and napkins, flatware, plates, etc, everything one could imagine may be required. When he had this spread laid out it was something to behold – just like walking into a reception at a major hotel or something you’d see on a cruise or the like. The Food Crew - and no, that isn't Mr. French, that's Chef Gerard! One aspect we’d decided to implement was a scrolling slideshow of images. The image at right shows my laptop and digital projector placed on a pedestal in the rear display area. This also provides a look at two of the primary display walls. Our thinking was that people checking out the images in this area could view this slideshow as a conversation piece if the room wasn’t crowded. The room actually had a great deal of activity during the reception and we were pleased to see many people viewing and commenting on the slides as they scrolled through. There were nearly twelve-hundred of my images in this display – a much greater body of works collectively than the wall hangings. Another view looking towards the digital projector. This photograph somewhat portrays the elegant setting for the reception. Besides doing whatever was required for the opening exhibit, Holly was conducting business as usual. She and Sal greeted customers throughout the day as the preparations continued. Multiple people came in late afternoon before the 5:00 PM reception started and were treated to Gerard’s efforts as he set up the elegant serving dishes while they looked around. I liked this because it was a much more quiet preview of what was to come later. I talked with one fellow at length about our Newfoundland travels and the images on display from this trip. 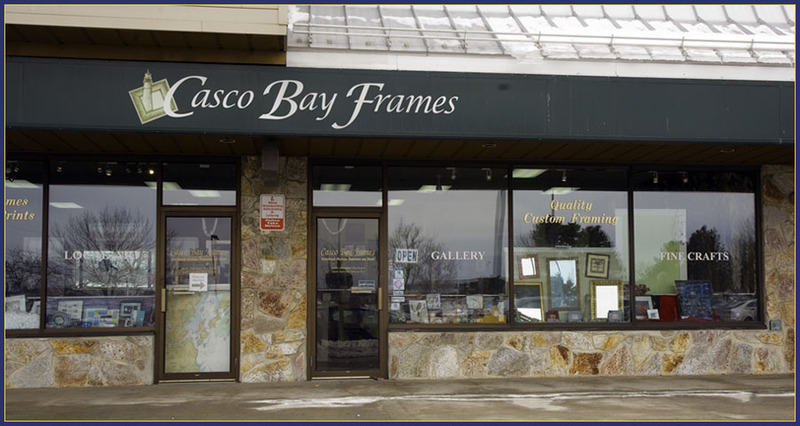 As you walk into Casco Bay Frames through the center storefront, on your left is their gallery, the work area with an extraordinary number of frame samples is on your right and if you continued walking straight you would be standing in front of their checkout desk. At left near the desk is an open walkthrough into the rear display area, which contains their programmable mat cutting machine and another work area. The following photographs will indicate the different areas where the images were displayed and overall will provide a fair rendition of what the shop looks like until you visit in person. Another view of the lighthouse images on exhibit. The photograph below has a good deal of glare from the storefront windows, but one can obtain a good idea of the lay out of the exhibited works on this front room wall. This area was a display of framed landscapes and astronomy images. This photo makes it quite easy to ascertain the professionalism of the presentation. All my framings and ArtiPlaq™ mounted pieces were done by CBF and this will continue to be the case. You can see more astronomy shots in the back room through the cut out in the wall. This is a right side view as you come through the CBF entrance door. In view is the start of the plethora of frame samples they offer their customers. The pedestals have a few of my images placed along with my business cards and announcements pursuant to the event. In the background can be seen a Sandhill Crane image with a bin of my images below. This photograph is a close up of the display viewed in the image above with bird photos and an ‘introduction to the artist’ on either side of the vase. Tony placed strategic lighting at points that accommodated these displays well as the sun set before the reception. These pieces are all ArtiPlaq mounted through CBF. 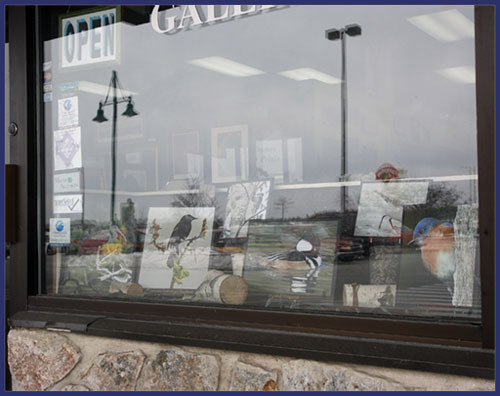 Although in the glare, the images in the front window display can be seen in the photograph below. This is behind the display above. This photograph indicates the backside of the pedestals looking out through the entrance door. A butterfly and bird image are mounted on top with bins containing my images on mount board and wrapped on display. The ladies were quite creative with the many images to exhibit and one had to really look around because they had them placed all around. This was one of my favorite nitch areas that Holly came up with I call the ‘Cubby-hole’ display. Tony added lights to accent this area and if people took the time to really look it over they would find it contained fifteen images plus some other goodies like the announcements and my photography cards. We learned that people are partial to dragonfly images and these were well received. Some liked the spider images, taken in my backyard but the ladies in particular weren’t too enthusiastic... Many commented on the quality of the spider shots as you don’t generally see a close up like these, but I suppose a garden spider imaged and enlarged about 250 times life size with a macro lens wasn’t what they were seeking… I’m better equipped to image smaller critters these days and next summer plan to do some more macro lens works. The sign indicating the gallery opening can be viewed through the door at left in this image. The images below indicate two sides of the same pedestal each with an ArtiPlaq hanging. The spider web is next to a primary gallery wall and the Orion Nebula stands out prominently against the blue paint color Tony selected. The side next to it has a Downy Woodpecker view. This wall contains landscapes and bird images displayed above computers the staff employs when entering information for framing tasks. The entrance to the back display area can be seen through the wall opening. A pair of Mandarin ducks can be viewed displayed on top of the shelf unit. This view looking towards the checkout desk finds a pair of Ruby-throated Hummingbirds on display in the center front. I’m not certain if anyone would or could notice these tucked in where they are but I thought they were located in a clever fashion. Displayed images can be viewed on all three sides of this work station. This photograph represents another area I thought was very tastefully displayed. Tony’s color choice here was exceptional and really pulls the colors out of this group of ArtiPlaq mountings. This exhibit consists of birds with one lonely dragonfly image. I heard many positive comments over the evening on how this was presented. There were images displayed just about everywhere you looked. These pieces were placed on a shelf next to the wall in the image above. I didn’t get all the floral ArtiPlaq mounting on top in this image but this can viewed in the photo above to provide an idea of the overall look. This collection of nature images was next to the checkout counter register. As a customer it would be on your right as you faced the desk. I thought the spider web was eye-catching against the black background. These three framings were hanging high up to the right as one faces the checkout desk. The image on the left, 'Fore & Main', is one of my signature shots taken on a Maine schooner and it was used on my black & white photography cards. The middle image hangs in Kathy’s office at work and the framing at right, an eclipse shot taken in Eastport, Maine looking over Campobello Island in Canada, is one of the most widely discussed images whenever it is displayed. Now we’ve walked through the wall opening into the back display area where the matt cutting machine is located. It was in here that the digital projector displayed the slideshow and most of the astronomical pieces were exhibited. Needless to say like all the others, this display area received a good deal of attention during the reception. This view is looking towards the front of the store and one can see through the wall opening into the storefront and beyond. This wall had bird images prominently displayed as can be viewed here. The image below represents the primary astronomical image display for the exhibit. This was taken before Holly and Sal had completed the final preparations including cleaning off the counters and installing tablecloths. However, one can clearly envision how this area looked in conditions with the mountings displayed under good lighting. The effect was excellent and it was truly an outstanding presentation. This display of bird images would be on your left as one walked out of the rear display room. This photograph also provides a fine idea of how the images were exhibited with strategic lighting to accent the works. Most of this ArtiPlaq mounted group was imaged in Florida and this exhibit did them justice from my perspective. As we near the end of our ‘tour’, I made the composite below to show the wall of bird images on either side of the opening to provide an enlarged view. Attempting to photograph our many visitors during the reception was something that had been considered and recognized as simply not practical. At the time I thought about this I had little idea how packed the exhibit area would be in the timeframe of the reception. I had my camera tripod mounted and in the back the entire time but was so busy speaking to folks that I never really considered doing anything with it. It was decided that all of us should enjoy ourselves and take advantage of the moment. However, my friend Ron Thompson had his point and shoot camera and he took some photos. Ron was kind enough to provide the images for this section. In this photograph Gerard is refreshing the serving dishes as people wait for more of his goodies around the serving tables. Visitors at the reception can be viewed at both sides of the wall talking and checking out the exhibit. The guest book can be viewed on the table. The reception was well attended and everyone was spread out in the various areas. This photograph is looking towards the serving tables. My friends Rich and Gina flip through the binned prints mounted on foam core during the event. Thanks for the photographs Ron! I talked with many people involved with photography and other artistic endeavors in the course of the evening. I can only say I was more than gratified hearing the comments from people viewing my work, especially those also involved in photographic pursuits. Several have emailed indicating that the exhibit was exceptionally well received as they listened to attendees commenting on the displays as they walked about. Your support and kind words of encouragement are much appreciated and I thank you. By 8:00 PM it had been snowing for awhile and the roadways started to receive a fresh blanket. We were fortunate that it held off as long as it did contrary to the weather forecast. Gerard had distributed the remaining food items and got on the road, returning to Massachusetts. He’d made a trip from Baltimore especially for this event and had been working diligently both in preparation and execution. There were still some people hanging around and Holly, Mike, Sal and their significant others & friends remained. My camera was set up and had to be packed up so I pulled it out from the back and took a few images before heading home. Andrew and Sal – I’m fairly certain they knew each other before all the wine… Actually Andrew indicated they've been together for some time. This cute little dickens is Holly’s nephew Zane – also known as ‘Moon Face’. He was kind enough to bring his parents to the reception so they could look around, enjoy the exhibit and wonderful food. Zane did appear to enjoy himself from what I could see and was extremely well behaved. Holly told me little Moon Face would be at the reception and I’d looked forwarded to meeting him. It had been a great night, but they were right, it was time to get home and beat the balance of the snowstorm. This evening simply commenced the photographic exhibit. It will be in place for the balance of February, so I’m certain I’ll be adding to this account as things progress…. A note about the photography...Unless specifically credited otherwise, all images in this account are by the author. Any images viewed that are displayed at Casco Bay Frames are from my collection of works for sale. The web versions viewed are fair representations, but a full resolution print significantly enhances the beauty of these images; all are ©Photography by Kirk M. Rogers - any reproduction, publication or transmission of this content without the written consent of the author is prohibited. Please contact me should you have an interest in obtaining any of the images.